3"H x 2"W x 1-1/8" thick, 1.5 oz. 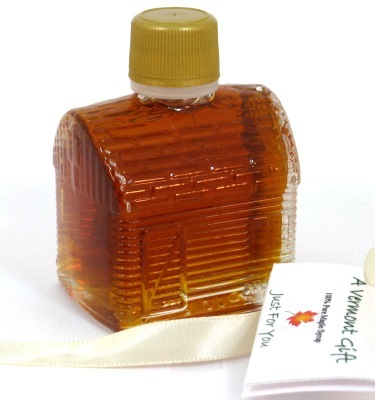 This log cabin glass bottle of syrup is very popular, fashioned after the traditional log cabin maple syrup tins. Filled with 1.5 oz. 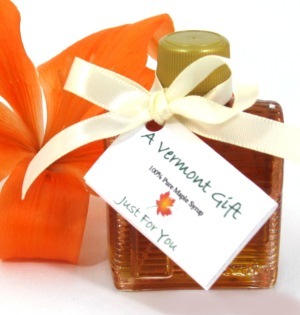 of 100% pure Grade B maple syrup, produced in northern Vermont, it makes a delightful Vermont wedding favor. Your guests can sip this pure maple syrup right from the nip jug, or take it home to enjoy over ice cream. Or, your guests can sweeten their dinner coffee with the syrup as well. It's delicious!